Buy New FUJIFILM 25 Instax Mini Camera Orange (HALLOWEEN) Malaysia At FotoZZoom! The Fujifilm Instax Mini 25 is a compact, instant film camera that you'll want to take everywhere. Retro styling, and simple operation makes this point-and-click camera great for parties, art projects, or anywhere you'd like to take instant photos. The camera produces near-instant, vivid, high-quality credit card size prints. The camera has an LCD film counter and shooting mode display. The automatic electronic flash allows you to capture the perfect photo even in low light. The Fujifilm Instax Mini 25 lets you shoot and share amazing pictures with ease. 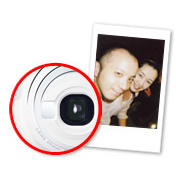 Additional fun features include a close-up lens, and mirror for self portraits. Fun, credit card-sized prints LCD film counter and shooting mode display Camera mounted mirror for self portraits Includes close-up lens allowing you to get as close as 13.78" (35cm) to your subject Automatic Electronic Flash. The Fujifilm Instax Mini 25 is a compact, instant film camera that you'll want to take everywhere. Retro styling, and simple operation makes this point-and-click camera great for parties, art projects, or anywhere you'd like to take instant photos. The camera produces near-instant, vivid, high-quality credit card size prints. The camera has an LCD film counter and shooting mode display. The automatic electronic flash allows you to capture the perfect photo even in low light. The Fujifilm Instax Mini 25 lets you shoot and share amazing pictures with ease. Additional fun features include a close-up lens, and mirror for self portraits. The Lighten-Darken Control adjusts the intensity of colors to make the print finish brighter or darker. 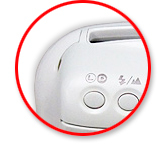 The two shutter buttons on the body make vertical and horizontal shooting easier. 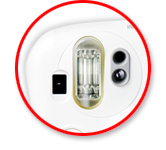 The camera detects the brightness of the background to control the shutter speed. Backgrounds can be captured clearly even in dark rooms. The small mirror beside the lens is useful to check the framing for taking perfect self-shots. Instant Film Fujifilm Instant Film "Instax Mini"